← How can we help prevent unethical and dangerous alternative uses of mHealth tech? 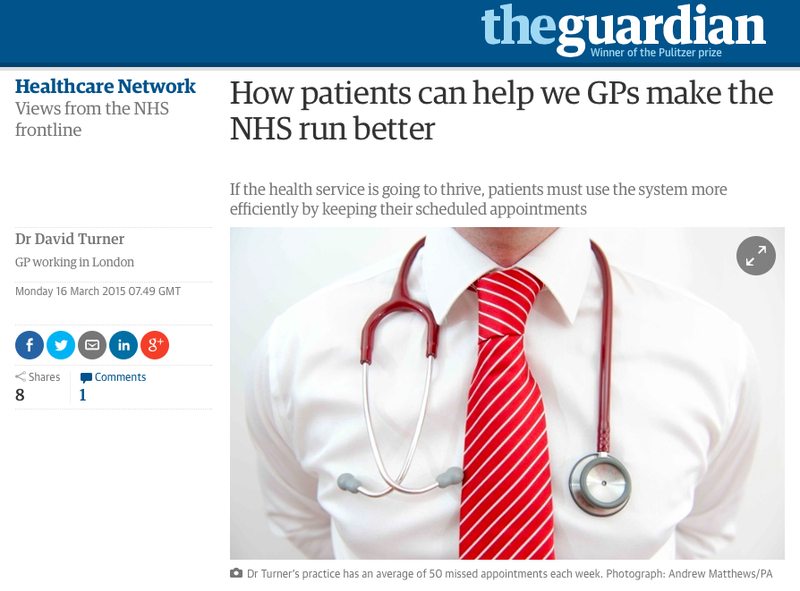 This interesting ‘Views from the NHS frontline’ article by Dr David Turner, a GP working in London, in today’s Guardian shares some interesting insights into how GPs in the NHS think about the work they do before calling for “an open and honest debate, not just about what the NHS should be doing for patients, but what patients could do to make the NHS run better“. I think it’s clear that we all need to move beyond the idea that the product we are making is scheduled visits. The first question should not be why this Patient is 5 mins late but why anyone would want to see a Patient with needs like this at 9.05am on Monday morning (the busiest period in a GPs week)? It’s highly unlikely that the appointment was scheduled over the weekend, or that her father was diagnosed over the weekend or that the non-payment of rent was an issue that manifested itself over the weekend so this is a Patient who’s probably been worrying and losing sleep all weekend and has probably had to take time off work (no doubt further escalating the problem of unpaid rent!). Imagine how much better a Patient like this could work with Dr David Turner if he worked in a NHS GP practice that used the AskMyGP product (as used in NHS GP Dr Amir Hannan in Greater Manchester). In London in 2015 you don’t need to wait for an available GP appointment to get financial advice. The Citizen’s Advice Bureau has a website, telephone number, local offices and a self-help website (adviceguide.org.uk) that provides practical, reliable information and suggestions like online budgeting tools that you won’t find within any medical school syllabus. In London in 2015 you don’t need to wait for an available GP appointment to learn about the issues of caring for a father with Cancer. Cancer Research UK for example have forums dedicated to Caring for someone with cancer within their “Cancer Chat” Forums. In London in 2015 you don’t need to ignore a packed waiting room for 5 minutes while you work out your Patient is late simply install a Patient Arrival System to manage your waiting room Patients so you can automatically begin seeing other Patients in this schedule gap. When you appreciate that difficulty getting out of bed is often a symptom of depression I think it should be abundantly obvious that the best place to share your feelings about depression aren’t a rushed appointment in your GPs office at 9 am on Monday morning. I wonder if this Patient picked this time slot or if it was prescribed by the front desk receptionist when the Patient called in to make an appointment? I think this is just a design issue. GPs are trying to get away with a one size fits all model and the varying complexity of illness means we can no longer do this eg. Does ‘John’ need your time or attention?, the 2000 year old model of healthcare is broken forever, etc. Yes mobile appointment reminders are a big help and ‘please confirm your attendance at tomorrows consult’ reminders can also help but they’re not a silver bullet solution to the failure of GPs to use the tools of our time. When your GP surgery only offers in-office appointments why is anyone surprised that some Patients are making them and then not going? Is it really that hard for us to predict this behaviour? When appointments are limited and offered on a first come first served basis (without even attempting to consider the particular Patients needs) is it any surprise that Patients and Carers will want to confirm appointments when they know they don’t really need them because they are frightened that things might get worse later when the available appointments for that particular day are all gone? Funding is a really big issue for innovation within NHS primary care. One solution I think is very promising is the Prime Minister Challenge Funding (the AskMyGP product qualifies for this so NHS GPs can have a secure online portal that can get a product added to their existing IT systems that can begin tackling capacity/demand challenges without the need to pay for all those expensive innovation consultants, IT experts, Pilots, Audits, etc). A great reminder of how the modern NHS GP consult is increasingly being influenced by external political, financial and administrivia that sadly all too often have nothing to do with what’s best for the Patient or Doctor. Taking a history is hard enough but trying to do it through an interpreter is impossible with the demands and lack of resources being made available to GPs in the NHS today. It’s obvious that consultations that take place through an interpreter can be greatly aided by the use of interactive Medical History Taking software and with so many foreign trained NHS GPs it also enables better use of NHS talents eg. if there’s a life changing result that needs to be shared with a Patient it’s probably best to refer them to a Doctor colleague who speaks their language than to try and relay such sensitive information back and forwards through an interpreter.